Casa Bonita is based in Cotopaxi Province. Many people only think of this area as being the location of Cotopaxi National Park, the Avenue of the Volcanoes and Lake Quilotoa and its Loop. These are important but not everything. Much of what is normally presented for this area is fairly physical and not all of us are so inclined. But if you are we are happy to provide you with some adventure links. However Cotopaxi Province is much more. There are historical sites or areas of "patrimoni". There is a very large indigenous Kitchwa culture here. There are extraordinary vistas high in the hills reminiscent of Scotland. 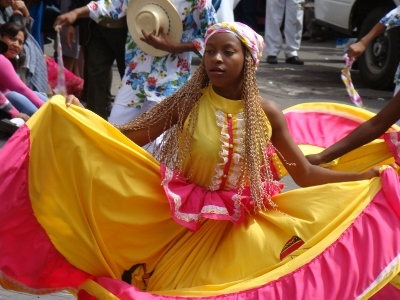 Non-touristy events and festivals abound along with 2 of the biggest in the whole country: Mama Negra in Latacunga and Corpus Christi in Pujili. And our little known secret is the La Mana area to the west where cocoa, bananas, sugar cane and coffee abound, along gorgeous tropical flowers and heat! What we have done here is listed some services we can offer to facilitate getting here and to local places. 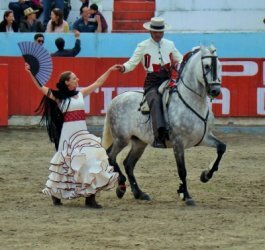 But in addition we have listed ideas for excursions, many more cultural or soft adventure, that we can take you on when you are in Cotopaxi, especially at Casa Bonita. These are suitable for 1 to 3 persons when provided by us. I myself can accompany you if your need English. If you are Spanish speaking Fernando or Isabel can help you. We have a Kia Sorrento 4 x 4 which works well in this area and Fernando is a very good driver, knowledgeable of many of the more local but interesting routes. I also have my Ecuadorian driving license and can take on less strenuous routes like to Saquisii. If anything here interests you please let us know when you make a booking or contact us shortly after. Escorted Tours (with car, driver Fernando and possibly Linda guide). Pricing will be developed shortly. 1. Drive to and from Tigua to meet artist(s) and see artwork in several stores. 3 hours. 2. Drive to and from Quilotoa – and waiting time – for vistas, hiking - 4 - 8 hours depending on activity. 4. 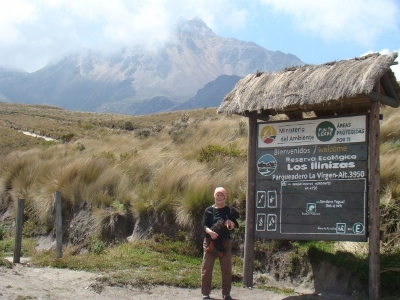 Drive to and from Cotopaxi National Park including paid park guide (needed to drive in park) with enough time to drive through park for vistas or more if you desire to walk to and from the Refugio - 4.5 - 8 hours. 5. Drive to Banos de Santa Agua (guests return by bus) and orientation - 2 - 2.5 hours. 6. Drive to and from Banos de Santa Agua with waiting time, thermal pools, drive to aerial tram, vistas, lunch, water, historic central church - 5 - 8 hours. 7. Maca Hills family experience (drive up rough back roads, visit to straw house, abuela, cuyes, short walk in the hills maybe at Gonzalo’s mothers or other, visit to see poncho making, photo opportunities) - 3.5 - 5 hours. 8. Maca Hills back roads experience, using many back routes, mainly for vistas and seeing rural life), water, snacks and packed lunch - 4 - 5 hours. 9. Drive to or from Saquisili, with escorted tour about market to make an exotic fruit selection, return to house to prepare – with Isabel) - 3 hours. 10. 2-day La Mana Experience in and near La Mana, Cotopaxi – Includes drive to and return, visits to see cacao, coffee, sugar cane and banana grown, introduction to Panela production, overnight accommodation in La Mana with breakfast, water, snacks for drive, Day1 lunch and dinner not included but at tipicos, Day 2 visit to a small working finca, tipico lunch included. 2 days, 1 night. 11. Ambato Botanical to visit the botanical garden, includes driver, return drive, admission, lunch at a tipico - 5 hours. 12. 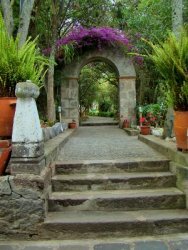 Ambato Botanical & Historical tour to visit the botanical garden, historic properties with gardens, admissions, includes driver, return drive, lunch at a tipico - 6 - 7 hours. 13. Escorted tour around Latacunga: museum, parks, Salto shopping (2 buildings), other central market (Tues, Fri & Sat), artisans shops, lunch at a tipico or better, stone convent across from the Parque Bolivar, Mirador El Calvario on Avenida Oriente and Isla Fernandina - 4 hours minimum. 14. Escorted tour to Victoria, a nearby community that specializes in terra cotta pottery. Visit the various shops, see the techniques / ovens for making this pottery, perhaps shop, see the village square, stop for a lunch tipico - 3 hours. 15. Drive to and from Illinizas Ecological Reserve with wait time for hike, return lunch or dinner at a tipico - 6 -8 hours. 16. Drive to and from major Community Events such as Mama Negra, Corpus Christi (2016 May 26 - 29), small festivals, events in bull rings, music events, includes driver and driver, waiting time, purchase of seat or admission, water and snacks. Various, 3.5 - 6 hours.